Throughout my life, I have purposely avoided engaging in elaborate public breakups. But as I arrive in Brighton one evening in March, I know I have to put an end to things. I’ve had enough. I am sitting with 25 other souls in Cambridge Naturals, each of us strategizing exactly how we plan to dump our toxic relationships. Gathered in folding chairs alongside the kombucha tap, we take turns enumerating our angst. Some believe they’ve gotten far too complacent. Others admit they’ve been taking things for granted. And there are a few who say they walk through life feeling a tremendous sense of guilt. I am among that last group. There’s the immediate regret I feel after using a Keurig pod. The self-loathing I experience every time I toss a fork in the waste bin. The creeping sense of dread each time I empty the diaper pail into the trash. I know I need to end it, but I have no idea how. Plastic and I are just too codependent. Our relationship started to deteriorate last summer, during the great straw backlash of 2018. In a few sweeping weeks, it seemed the world suddenly awoke to the fact that single-use plastics were killing the planet (and that hundreds of millions of straws being used every day across the United States was excessive, to say the least). Many companies took the anti-straw campaign as a moral imperative to change their ways. Starbucks, IKEA, and Marriott all announced they would purge themselves of the devil tubes. I felt heartened, as I typically do when the zeitgeist zeroes in on environmental action and forces cultural change. I got that same hopeful feeling when Boston enacted its bag ban this past fall — Massachusetts now has plastic bag limits in 94 cities and towns, and there’s a bill in the works to ban them statewide. So I picked up a metal straw and started bringing a cloth tote bag with me at all times. But I also increasingly felt a sense of gnawing guilt. These bans were, in some ways, a straw man of sorts — a symbolic measure, but hardly a fix for the devastation that plastic is wreaking on our environment. The root of the current plastics backlash dates to January 2018, when China refused to accept any more recyclables from Western countries because they were larded with food and gunk, far too contaminated to process. Since then, municipal recycling services in Massachusetts and across the country have been forced to reckon with a new reality. Without a viable secondary market for used plastic and paper, waste management companies have been charging municipalities more to collect their waste. That’s forced hundreds of cities and towns to crunch the numbers and begin scaling back what they’re accepting from curbside programs, or in some cases suspending them altogether. For many municipalities across the country, it’s more cost effective simply to incinerate the waste instead. 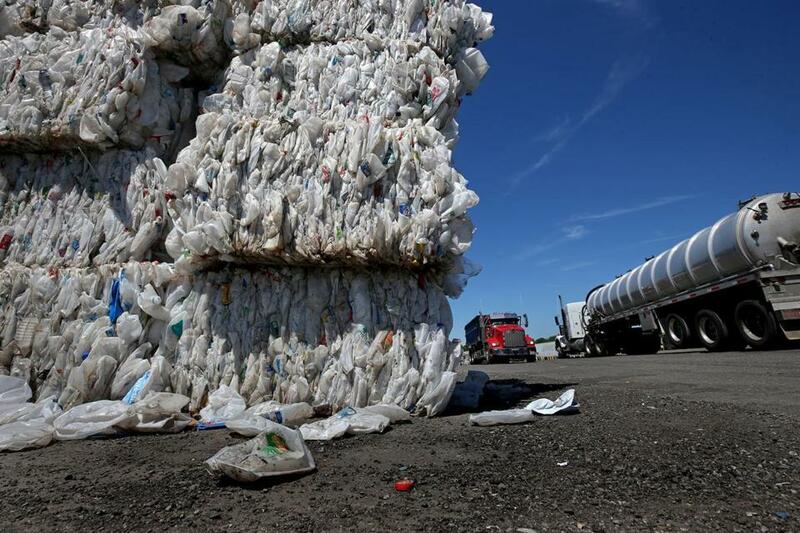 Last August, Massachusetts changed its recycling guidelines statewide, rejecting items that were once considered recyclable, such as paper-based dairy and juice cartons, and the state’s Department of Environmental Protection has also begun telling citizens to avoid bagging their items, as plastic garbage bags tend to jam up the machines. In most cases, anything in a plastic bag will be treated as trash, according to the new standards. Some communities, such as Plymouth, have suspended curbside recycling programs, while Newton and others began rejecting the recycling from serial abusers whose refuse is routinely contaminated. The Sierra Club’s Clint Richmond sees the new recycling reality as a moment to reassess our values. “This is not a recycling crisis, it’s a consumption and materials crisis,” says Richmond, a solid waste expert on the executive committee of the club’s Massachusetts chapter. Calling himself a “radical recycler,” Richmond believes we should stop producing and recycling plastics altogether due to the toxic chemicals that end up leaching into our bodies, water, and food supply. “Recycling is a fig leaf on the plastics problem. It’s justifying a lifestyle that’s based on permanent overconsumption,” he says. All of this is very unsettling for those of us accustomed to mindlessly tossing our goods in single-stream recycling bins. For the first time in generations, we’re coming to terms with the fact that the things we think we’re recycling are actually being thrown away. If you can even call it that — “away” doesn’t really exist anymore, if it ever did. Only 9 percent of the plastic created on earth has been successfully recycled, according to a 2017 analysis from scholars at the University of California, Santa Barbara; the University of Georgia; and the Sea Education Association in Woods Hole. A mountain of plastic at E.L. Harvey and Sons, a recycling facility in Westborough. So I’ve come to the evening’s event at a Brighton natural-goods store to start anew. In the front of the room, our instructor Sarah Atkinson explains why she’s trying so hard to reduce the amount of trash she creates each day. “I’m in a committed relationship with my waste,” she says. A few weeks before the class, I’d called Atkinson for advice on my quest to quit plastic. An idealistic recent University of California, Berkeley grad (is there any other kind? ), she recently settled in Cambridge and works at a local green construction company. One of the most important things to consider when beginning a plastics detox is your intentions, she explains. I should think about why I want to reduce my waste and sort out what small steps I can take toward cutting back. “Starting off is definitely the hardest part,” she says. I tell her I’m feeling pretty guilty about plastic silverware and other items I use without thinking when I’m out and about, so I’ve been looking to pick up one of those bamboo utensil sets. She says this is a great start. “But you don’t need to buy the bamboo or these more expensive products to be a zero-waster,” she cautions. This is a relief to hear, as I’ve been realizing that part of the problem with cutting back on plastic is figuring out what you’ll use in place of it. I worry about losing my actual silverware if I bring it to the office. Then I remember I have a set of reusable plastic utensils from IKEA that one of my kids uses for all his meals. Perfect, Atkinson says. “It’s about finding the things that work for you and not necessarily having to go and buy all new items,” Atkinson says. Before she leaves the house, she typically packs a utensil set, two hankies (one to avoid tissues, another to use as a napkin), a mug and water bottle, and a glass or plastic to-go container so she can take whatever food she wants to bring home without creating more waste. Seems reasonable. She recommends that I audit my own waste to see exactly where I have the largest plastic problems. I should determine the most troublesome parts of the house — the kitchen? the bathroom? — and start there. I hang up feeling hopeful. Over the ensuing week, I begin to tally the damage: Milk jugs, kefir and juice bottles, bags that housed mozzarella cheese and celery, yogurt cups, so many applesauce pouches, blueberry bins, and a tiny cup stuffed with guacamole from Chipotle. Once I begin thinking about plastic, I see it everywhere. And I begin to question all of my choices: Why is my shower crowded with 16 bottles of shampoo and body wash? How can I keep my mouth clean without a plastic tube of toothpaste? Is it humanly possible to feed a toddler without a plastic bag of frozen chicken nuggets on hand? By the time I arrive at the evening’s session — officially called “Waste Not, Want Not: Shifting Toward a Zero-Waste Lifestyle” — I am back to feeling overwhelmed. I quickly realize that most people in the room are far ahead of me in reducing waste. I meet Janet England, who picks up trash on the streets, buys her food at farmers markets and at the local-focused Wildflower Pantry in Brighton, and does most of her cooking at home. Vidya Sivan is focused on cutting back both her trash and the infrastructure that helps create it — she has reduced her waste to the point that she only needs to take out her garbage every six to eight weeks. Sabrina Auclair has her own low-waste Instagram account, UnpackedLiving, and is hoping to open an online store entirely free of plastic packaging. Speaking of Instagram, I’ve discovered the zero-waste hashtag community and begun clicking around among its influencers on the site: the ones who bake their own bread, make their own yogurt, and prepare their own zero-waste beauty products. It’s all very inspiring, until I remember that I have two kids, a dog, and a full-time job. So it’s hard not to feel hopeless as Atkinson pelts us with facts and figures: Americans typically make about 4 pounds of waste each day, which collectively creates more than 1,600 pounds of waste per person each year. There are currently 150 million metric tons of plastic in our oceans, and we’re adding about 8 million metric tons annually. All told, we’ve created 8.3 billion metric tons of plastic on our planet, and 6.3 billion of that has become plastic waste. Purging ourselves of all plastic at once isn’t the goal, she tells the room. We should use up all the products we own that are encased in plastic, then start to make decisions about how to cut back further. Maybe it’s buying items from the bulk bins at the grocery store. Using a shampoo bar instead of a bottle of liquid soap. Or choosing cleaning products that come in refillable or biodegradable packages. After the session, I tell her I’m still feeling overpowered, particularly as I watch the zero-waste influencers on Instagram toting around their year’s worth of waste in a Mason jar like a talisman. 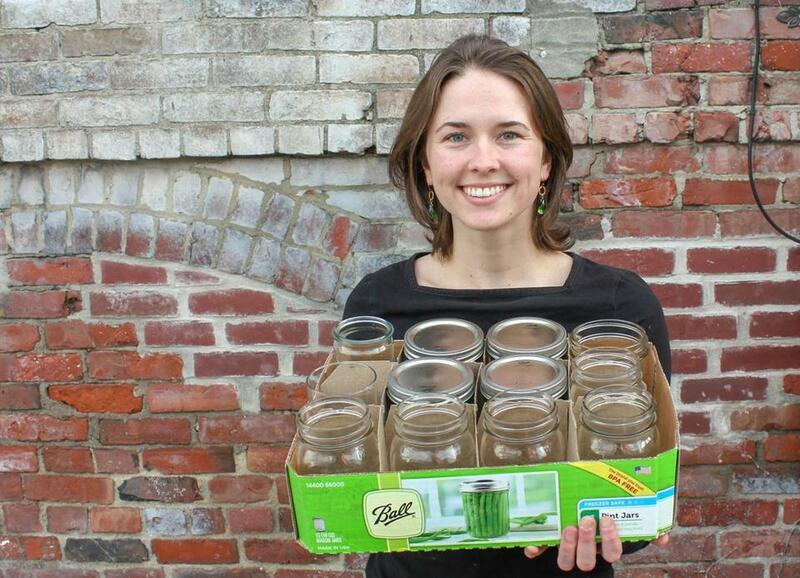 Environmental advocate Sarah Atkinson displays her set of reusable jars. “You have to find your own process and path,” she says. “We shouldn’t be trying to make it a competition.” She admits she actually doesn’t even like the term “zero waste” because it feels so unattainable. Instead, she describes her lifestyle as low waste, which feels more accessible. I have no idea. Making existential decisions for every single purchase is exhausting. As consumers, we can’t solve our plastic crisis in a vacuum. How did we get here? There is a classic moment in the iconic 1967 film The Graduate when Dustin Hoffman’s character, Benjamin Braddock, is pulled aside at his graduation party by a friend of his father’s. The older man wraps his arm around Benjamin in the dim light of the pool deck. In that moment, the plastics industry symbolizes a dreary post-college reality, one that helps set off Benjamin’s existential crisis. But truth be told, anyone who followed that advice would be rich today — based on the sheer amount of plastics in my house alone. America did start to wise up to the fact that plastics were landing in the landfill in the late ’70s, when early curbside recycling cropped up (I can still remember learning about no. 1 and no. 2 PET plastics when I was in elementary school in the ’80s). But recycling — particularly single-stream recycling, which began in the 1990s — assuaged our conscience. The things we tossed in those blue bins weren’t being sent off to a hellish eternity in a dump, but instead were being reborn. That plan, of course, didn’t work out as well as we thought. “Everyone thinks they’re being virtuous, but they don’t realize how little single-stream recycling is actually being treated,” says Bateman. It would be far better to get consumers to reduce plastic use than to delude ourselves into thinking we can just recycle things away, she says. Therein lies the challenge. Plastic isn’t just ubiquitous — it has imprinted a set of values on us, she says. Consider, for instance, laundry detergent. Detergent makers have had far more powerful formulas on hand for years, ones that would provide as much as eight times the cleaning power in a far smaller container. “But the consumer is not ready to deal with that,” Bateman says. “When they see the big bottle, they see big value.” And there’s little incentive for the detergent makers to change things on their own because if the product is smaller, they get less space on the shelf. In these cases, the onus has actually fallen on retailers to drive the change toward waste reduction, which is also more cost-effective, Bateman explains. It wasn’t until Walmart demanded in 2007 that detergent makers offer more powerful formulas for its stores that the consumer goods companies stepped up. A year later, Walmart boasted it had achieved its goal of offering only concentrated laundry detergent to consumers. Amazon has had a similar impact: Last year, its engineers worked with Procter & Gamble to create more sustainable packaging for Tide. The new design features a more concentrated formula that ships in a cardboard box that doubles as its container. It uses 60 percent less plastic and 30 percent less water (and it kind of resembles a box of wine). Some retailers have gotten wise to the recent surge in environmental concerns and have decided to take on the plastics problem. In February, Walmart announced it wants its private brands to all have 100 percent recyclable, reusable, or compostable packaging by 2025. And Trader Joe’s recently announced plans to reduce the amount of plastic packaging in its stores, particularly the plastic-wrapped produce, flowers, and greeting cards. Bateman acknowledges that these decisions aren’t simple for manufacturers. “It’s easy for a consumer to say, ‘I no longer want my fruits and vegetables packaged in plastic,’ and while I advocate for that, I also know it’s hard to move blueberries” along a supply chain, she said. “The repercussions for any change will have a big ripple effect” she says, from completely reconfiguring processing and packaging plants to assessing how to ship and store goods safely without destroying products in the process. A movement is underway pushing manufacturers to take more ownership over their products’ packaging, says Gretchen Carey, the recycling and organics coordinator at Republic Services, the recycling and solid waste collection provider that handles the residential waste in many Massachusetts towns and at several big Boston universities and lots of large businesses in the city. Carey is also the president of MassRecycle, a nonprofit that works to limit waste and increase recycling statewide. One of the organization’s current missions is to promote a concept popular in Europe called “extended producer responsibility,” which requires manufacturers to oversee the treatment and disposal of their own products. That means a detergent maker would be responsible for stepping in to collect its big bottles once we’re done using them, for instance. There have been some promising steps toward building what the Ellen MacArthur Foundation has dubbed the “circular economy.” The nonprofit’s “New Plastics Economy Global Commitment” effort is pushing governments, manufacturers, global companies, and financial institutions to commit to eliminating the plastic items we don’t need, and innovating so that all plastics we do need are designed to be safely reused, recycled, or composted. The goal is to have all plastics “circulating” in the economy instead of dumping them in the environment by 2025. The foundation’s most recent report, released in March, was heartening: It has secured such commitments from six of the 10 largest consumer packaged goods makers in the world; five of the top 15 global retailers; and four of the top 10 plastic packing producers. And then there’s Loop Industries, a different Quebec-based company that’s created a chemical way to break down and reconstitute the PET plastics used in bottles for things such as soft drinks, shampoo, peanut butter, and hand soap. Unlike mechanical recycling, which leaves plastic in a less-desirable condition after it’s been broken down, Loop’s recycled plastic is as good as the original product, says Nelson Switzer, the company’s chief growth officer. Switzer, a former Nestle executive, notes the water bottle has become “an iconic symbol for single-use plastic and plastic waste.” He jumped over to the startup in part because of the impact it can have globally if Loop plastic hits the mainstream. “We’re taking the petrol out of the petrochemicals, and we’re using waste material,” he says. So far, companies including Coca-Cola, PepsiCo, and Danone have all signed on as partners. My own consumption habits have already begun to change in the few weeks since starting my plastic breakup. I’ve begun bringing my IKEA silverware to work, have avoided the dreaded Keurig, and had milk delivered in glass bottles from my local dairy. I’ve stopped using plastic sandwich bags and cling wrap. I’ve picked up cloth vegetable bags for my produce shopping, purchased baby food in glass jars, and begun using reusable cleaning cloths to cut back on my use of paper towels (and the plastic they’re wrapped in). I even snagged compostable dog poop bags when I realized that Boston’s bag ban meant I no longer had a stash on hand. I acknowledge there’s a degree of privilege that comes with making these changes, particularly when I choose to spend a bit more money to buy plastic-free products. And I’m reminded of this with each purchase, as I’ve also been targeted with ads from a host of new companies and products seeking out zero-waste consumers, such as Who Gives a Crap (sustainable toilet paper), Dropps (zero-waste cleaning supplies), and Bite (little tablets that foam up in your mouth like toothpaste). Most want to offer you a subscription to keep you buying, but I haven’t signed up for any yet. Instead, I’m working through my existing plastic items, trying to use up what I have and do my research before I take the next step. I’m not sure I’m ever going to get to an entirely plastic-free life. But I’m hopeful that I’ll be able to make more thoughtful, impactful purchases. 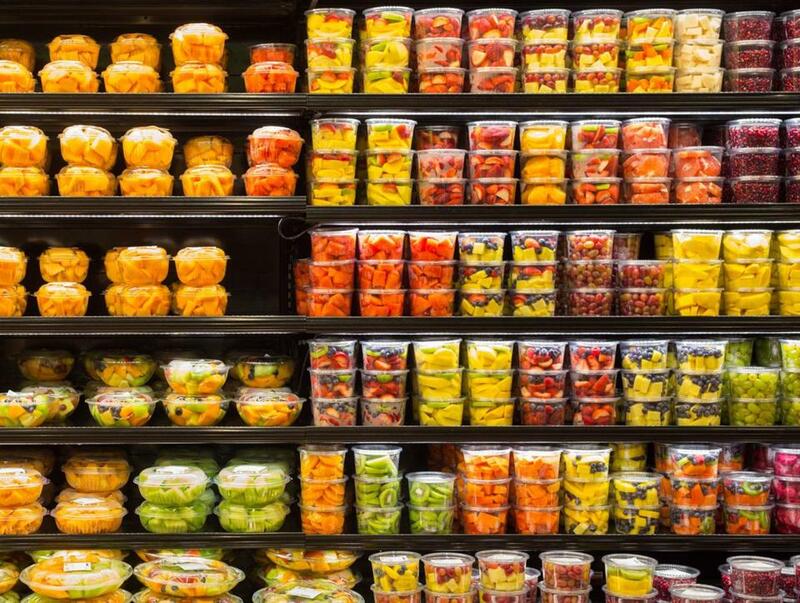 I plan to do more buying in bulk and am looking forward to farmers market season, so I can pick up local fruits and vegetables free of plastic packaging. I’m curious about trying a shampoo bar once I finally work my way through the bottles cluttering my shower. And I’m eager to see the face of the deli guy in my grocery store when I ask him if he can put all of my meat and cheese in reusable containers. Instead, I found a brand that packages its deodorant in a cardboard tube. I had to search a bit to find a place to actually buy it, but it’s mine now. A small step. The scent is eucalyptus and lemon, but to me, it smells a tiny bit like success. Sarah Atkinson shares tips for beginners on how to bid adieu to the persistent plastic in your life. 1. Audit your trash. Evaluate your own waste generation to get a picture of what kind of — and how much — waste you’re producing. 2. Make easy switches first. Bring reusable grocery and produce bags to the store. Carry a reusable water bottle, mug, and utensils with you when leaving the house. Try to buy items in glass containers rather than plastic. 3. Phase out items packaged in plastic. And switch to reusables where possible. Use up what you have and research alternatives. Swap liquid hand soap in bottles for bar soap that is often unwrapped or wrapped in paper. Use cloth dinner napkins instead of paper ones. 4. Buy in bulk. And bring your own bags or jars when shopping. Find local stores that sell bulk teas, spices, grains, beans, flours, snacks (nuts, granola, trail mix), olive oil, liquid soap (hand soap, dish soap, laundry detergent), and toilet paper. Feeling especially ambitious? Ask your local store if they would be willing to start carrying bulk items. 5. Evaluate your buying habits. Do you need everything you buy? Could you buy things used? Could you repair certain items? Could you start composting and recycling more at home? Do you often let food go to waste? Could you share items with your friends? If you can’t completely phase something out, can you reduce your usage of it? Parents, start using cloth diapers only during the weekends. Limit store-bought deodorant to your most active days. 6. Be patient. Accept that you can’t be 100 percent zero-waste (yet). Let people in your community know what they can do to reduce their waste, too, and why it matters. Janelle Nanos covers retail for The Boston Globe. Send comments to janelle.nanos@globe.com.